On February 26, 2009, The Upper Deck Company (“Upper Deck”) filed a trademark infringement lawsuit against Konami Marketing, Inc. and Konami Digital Entertainment, Inc. (“Konami”) in the U.S. District Court for the District of Nevada. See The Upper Deck Company v. Konami Marketing, Inc. et al, Case No. 09-cv-00374 (D. Nev.). A copy of the complaint is available here. Upper Deck, a Nevada corporation, sells various sports trading cards and trading card games. One of Upper Deck’s trading card games is based on the popular Japanese cartoon (“manga”) and anime franchise Yu-Gi-Oh!, owned by Kabushiki Kaisha Shueisha and purportedly licensed for use in the United States by Konami. (Upper Deck’s own webpage on its Yu-Gi-Oh! trading cards even contains a link to Konami’s website in the upper left). Apparently, up until last December, Upper Deck and Konami had an agreement whereby Upper Deck was the exclusive North American distributor of Yu-Gi-Oh! Trading Card Games. 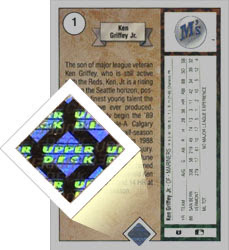 According to the complaint, Upper Deck has used a small square hologram (pictured above) since at least February 2002 to identify certain of its trading card, including Yu-Gi-Oh! trading cards – the logo appears in the bottom right-hand corner of trading cards. Upper Deck claims that the hologram not only serves as a source identifier (and apparently makes the cards more collectible), but also represents its specific, proprietary counterfeit-protection method to distinguish authentic trading cards from counterfeits. Of course, Upper Deck never bothered to actually register the square hologram as a trademark with the United States Patent and Trademark Office until January 2009. Upper Deck has two applications pending – one for the above square symbol and one for a round symbol. (While Upper Deck has registered many of its hologram shapes in the past, all but one have been canceled – the one current registration being a hologram version of the above shape of the Upper Deck logo – see below). Upper Decks also filed trademark applications for its “SQUARE” with the State of Nevada (here and here), both of which were issued on February 20, 2009. [Ed. –proving once again that you can get anything registered as a trademark at the state level, including a “square”]. Konami apparently terminated the aforementioned distribution agreement with Upper Deck on December 11, 2008. Nonetheless, Konami allegedly is now selling Yu-Gi-Oh! trading cards that contain Upper Deck’s hologram mark (or a confusingly similar type of hologram) without Upper Deck’s consent. 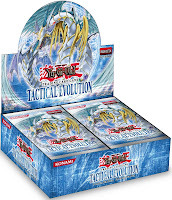 Upper Deck argues that Konami’s selling of Yu-Gi-Oh! trading cards with its hologram is likely to cause consumer confusion that Konami’s trading cards are sponsored by, endorsed by, or related to Upper Deck and will cause consumers to erroneously believe that they are purchasing Upper Deck products. Upper Deck’s causes of action are false designation of origin under 15 U.S.C. §1125(a); trademark infringement under Nevada law (NRS §600.420); deceptive trade practices under Nevada law (NRS §598.0915); and common law trademark infringement and unfair competition. Upper Deck has an uphill battle in trying to show that consumers really identify this hologram as it appears on the Upper Deck cards as a source identifier for Upper Deck’s cards and not recognized more for its functional purposes (i.e., identifying a genuine Yu-Gi-Oh! trading card). While Upper Deck claims that the square hologram is a protectable mark that consumers would recognize and associate with Upper Deck, with respect at least to the Yu-Gi-Oh! trading cards, the hologram clearly shows the words “Yu-Gi-Oh!” (and not Upper Deck). Should Upper Deck be allowed to prevent Konami (or any other company) from using a hologram on trading cards in order to promote its cards as authentic (in a world where counterfeits are rampant)? I am surprised Upper Deck is trying the federal registration gambit again. The TMEP actually has an entire section devoted to the previous Upper Deck refusal: See section 1202.14. "In 2001, the TTAB exorcised a quasi-“phantom” mark in In re Upper Deck Co., 59 USPQ2d 1688 (TTAB 2001) when it affirmed a refusal to register a “hologram device” as a mark for “trading cards.” The application stated that Upper Deck did not claim as a feature of the mark, its size, shape, content, or positioning on the cards. The Board found that Applicant’s hologram, without further definition, constituted more than one “device” as contemplated by Section 45 of the Trademark Act." John L. Welch (quoting myself from Allen's TM Digest). A hologram used in varying forms does not function as a mark in the absence of evidence that consumers would perceive it as a trademark. 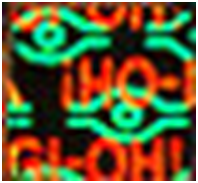 See In re Upper Deck Co., 59 USPQ2d 1688 (TTAB 2001), where the Board held that a hologram used on trading cards in varying shapes, sizes, and positions did not function as a mark, because the record showed that other companies used holograms on trading cards and other products as anti-counterfeiting devices, and there was no evidence that the public would perceive applicant’s hologram as an indicator of source. The Board noted that “the common use of holograms for non-trademark purposes means that consumers would be less likely to perceive applicant’s uses of holograms as trademarks.” 59 USPQ2d at 1693. Therefore, in the absence of evidence of consumer recognition as a mark, the examining attorney should refuse registration on the ground that the hologram does not function as a mark, under §§1, 2 and 45 of the Trademark Act, 15 U.S.C. §§1051, 1052 and 1127. Generally, if a hologram has two or more views, the examining attorney should also refuse registration under §§1 and 45 of the Trademark Act, 15 U.S.C. §§1051 and 1127, on the ground that the application seeks registration of more than one mark. In re Upper Deck, supra. See TMEP §807.01. I'm coming into this as a Yugioh player, not as a lawyer -- and, for our sins, we are trying to start up a league in the middle of all this confusion which is why I've gotten interested in the whole who's sueing who over what issue. For the record, although the very first cards Konami released in Japan didn't have the little square holograph mark in the bottom right corner, they have been using it on the Japanese issued cards since at least 2000. Please see http://yugioh.wikia.com/wiki/OCG_Set_Galleries:_Boosters and http://yugioh.wikia.com/wiki/Magic_Ruler. As a player and collector I certainly associate the design with the Yugioh! TGC (and by extension, the OCG), not with Upper Deck. While the cards that initiated the lawsuit were found in an Los Angeles area Toys R Us, the daughter of a friend of mine and I both bought some of the same counterfeit cards packaged by Vintage in the Toys R Us in Rapid City, SD during the later summer or early fall of 2008, leading me to suspect they were distributed nationwide. As a former Rep. working for Vintage Sports Cards until Dec. 2008, plenty of counterfeit Yogioh cards were shipped by Vintage into ToysRus, Walmart and Kmart across the US. Vintage had all their Reps pull the cards from retail shelves in Oct. 2008 when the counterfeit cards were discovered. Vintage took advantage of their Reps. having them unknowingly handle their counterfeit goods. Vintage and Upper Deck have a tight relationship as other products to include sports cards are repackaged by Upper Deck exclusively for Vintage to sell their customers (ToysRus, Walmart). Buyer's Beware of Vintage and Upper Deck. Can't wait until Vintage and Upper Deck go down big time! A real card should read ©1996 KAZUKI TAKAHASHI at the bottom.